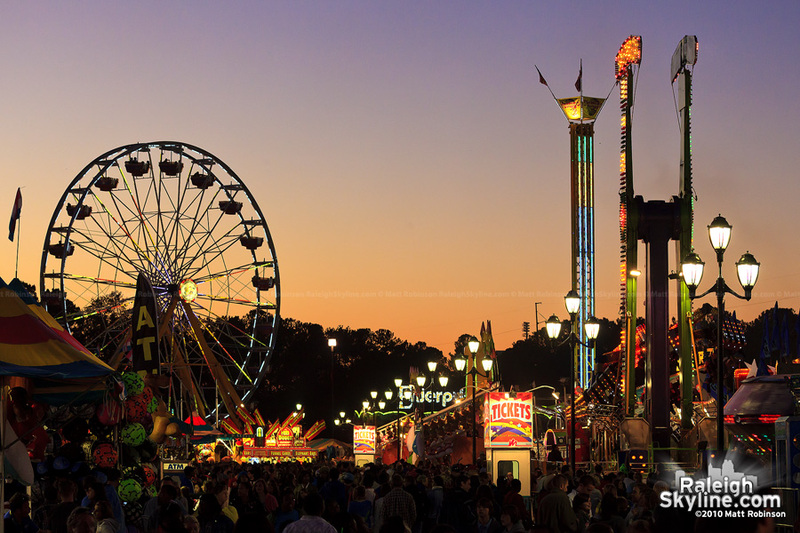 One of the most anticipated and popular annual events in North Carolina is the North Carolina State Fair held every October in the fair grounds. 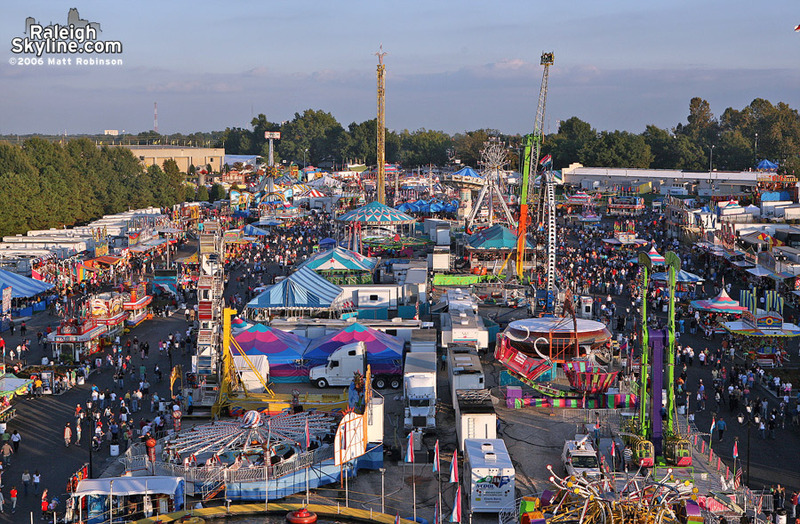 Nearly one million locals and visitors come to this 11 day event has everything from carnival rides and games, fireworks, concerts, exhibits, agriculture, to an even larger assortment of free entertainment and fun for family and your group of friends! The fair is managed by the NC Department of Agriculture and Consumer Services and is ranked among the top 25 fairs in the nation. One of the focuses of the fair is celebrating the state’s agricultural heritage and educate its importance. Their mission is to promote the state’s agriculture, agribusiness, arts, crafts and culture through the annual agricultural fair. They have competitive exhibits such as horticulture, cooking, and folk art for the local and regional population and award them with prize money. Some popular competitions include best pie, largest pumpkin, and best photograph. The best part of the fair would have to be the rides, games and the food! Be sure to not come to the fair if you are either currently on a diet, or planning on it. Some of the best fair food includes funnel cake, popcorn, cotton candy, deep fried oreos, deep fried twinkies…okay really deep fried anything, turkey legs, bucket of fries, a HUGE range vendors and the newly popular Krispy Kreme donut burger (I don’t know if I suggest this one, unless you want a mini heart attack). Be sure to stop be different vendors and let your taste buds go on a ride! Just don’t over do it and let your food digest before checking out all the rides! It is not a fair unless there are rides, rides for the little ones, rides for fans of spinning around in a circle at high speeds, rides for those who like to sit and be lifted into the air for a better of the fireworks and rides for those who want the twists and turns going at high speeds. Don’t forget about the assortment of fun houses where you can pay to make yourself feel dizzy and distorted. Here is more information on rides. The fair is also full of games where you can win fun prizes. By fun prizes I mean extremely large stuffed animals that might not fit into the car you drove to the fair in. You can have people guess your height, weight or age and you can show off your strength or skills with games like shooting a basketball in a hoop. If you end up bored at the fair, you can always check out the hundred of shop and business vendors that love giving out free stuff! Don’t forget about the live concerts that happen in the Dorten Arena and the long list of free entertainment they offer. Going to the state fair is a rite of passage for those in North Carolina and for the state to show off to other state visitors. The food may be overpriced and they could lower the entrance fee a tad, but for the fun and “fair experience” you’ll have is absolutely priceless! Just don’t over do it with the food and rides and your wallet won’t hate you too much.